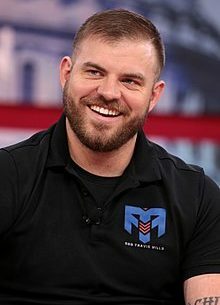 Retired United States Army Staff Sergeant Travis Mills, of the 82nd Airborne, is a recalibrated warrior, motivational speaker, actor, author and an advocate for veterans and amputees. Travis’s New York Times best-selling memoir, Tough as They Come, is currently available on sale in bookstores everywhere. Despite losing portions of both arms and legs from an IED while on active duty in Afghanistan, Travis continues to overcome life’s challenges, breaking physical barriers and defying odds. Travis lives by his motto: NEVER GIVE UP. NEVER QUIT. On April 10, 2012, SSG Travis Mills was critically injured on his third tour of duty in Afghanistan by an IED (improvised explosive device) while on patrol, losing portions of both legs and both arms. He is one of only five quadruple amputees from the wars in Iraq and Afghanistan to survive his injuries. Thanks to his amazing strength, courage, an incredible will to live, the heroic actions of the men in his unit, the prayers of thousands, and all the healthcare providers at the Walter Reed Army Medical Center, near Washington D.C., Travis remains on the road to recovery. Every day is a battle, but Travis continue s to astound friends and family alike with his progress and with his amazing spirit. SSG Travis Mills is a genuine American hero, and for his incredible sacrifice, we are forever in his debt. In September 2013, Travis founded the Travis Mills Foundation, a nonprofit organization, formed to benefit and assist combat-injured veterans. Travis also founded the Travis Mills Group, LLC where he consults with and speaks to companies and organizations nationwide inspiring all to overcome life’s challenges and adversity.